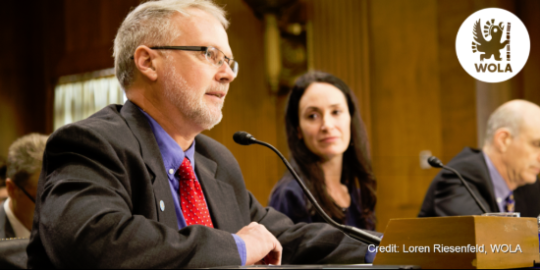 On March 2, 2017, WOLA Senior Fellow David Smilde testified before the U.S. Senate Foreign Relations Committee in a hearing regarding U.S. policy towards Venezuela’s political and humanitarian crisis. Below is a copy of his verbal remarks and a video recording of the hearing. To see a copy of his full written testimony provided to the Committee, click here. Thank you very much for the opportunity to testify about the Venezuela crisis and options for U.S. policy. Venezuela has been the central subject of my professional activity for the past twenty-five years–I first went to Venezuela in 1992 to do dissertation research, and I have been writing about it ever since. It is also an issue of intense personal interest. In Venezuela I formed my family, raised my children and spent fourteen of the last twenty-five years. Many of my closest friends and most valued colleagues are in Venezuela. With great dismay I have watched them suffer from a government that has radically mismanaged their economy and society, and is blocking democratic and constitutional efforts at change. The United States’ policy towards Venezuela should focus on facilitating the reestablishment of a democracy in which human rights are fully respected, including citizens’ right to decide what kind of government they want and who they want to lead it. In my view, the program of targeted sanctions rolled out in March 2015 is not the right policy for this goal. While these sanctions definitely provide a signal that the U.S. is against human rights violations, they also fit very nicely in the Maduro government’s international conspiracy theories, and thereby strengthen its interpretation of events. Furthermore, rather than being developed in concert with regional partners, the U.S. sanctions have been conceived and imposed unilaterally. Far from spurring regional allies to action, this unilateral character makes it more difficult for them to act with reference to Venezuela. Finally, while these sanctions have clear targets and can be attributed to concrete behaviors, there is no obvious path for easing or lifting them in the response to changes. Thus they effectively increase the exit costs for these officials and increase their loyalty to the Maduro government. It might be argued that, even if sanctions raise the exist costs of sanctioned officials, this will be outweighed by the deterrent effect on non-sanctioned officials. But the evidence suggests this is not the case. To the contrary conditions of human rights and corruption have only gotten worse. This failure is not because the sanctions went unnoticed in Venezuela. In fact, their rollout in March 2015 was news in Venezuela for weeks and months. And it is not because only seven officials were sanctioned. Deterrence is supposed to work through a social observation effect, and that should be effective whether seven or seventy officials were sanctioned. Fortunately, there are policy alternatives. First, given the marked deterioration of Venezuelan democracy, it is likely that work through multilateral institutions could come together in a way it has not in recent years. OAS Secretary General Luis Almagro’s invocation of the Democratic Charter in June 2016 was discussed but put off by OAS member states to see if progress could be made through a dialogue. Over six months has passed and it is clear that the Venezuelan government has used that dialogue process to buy time and deflect change. It is time for the Democratic Charter to be taken up again. The United Nations also has considerable potential to act with reference to Venezuela. A Peacebuilding initiative like that which was carried out in El Salvador in the late 1980s could be effective. Alternatively, the UN Secretary General could name a Special Representative to Venezuela. There are regional institutions that the United States is not part of but which could be supported. Venezuela is on the rocks with trade block Mercosur, but remains a member. Mercosur has a Democratic Clause aimed at protecting human rights that could still be invoked. There is also considerable space for bilateral and multilateral diplomacy. I have been encouraged by President Trump’s discussions of the Venezuelan case with the presidents of Argentina, Panama, and Peru. Regional partners need to have a lead role in U.S. Venezuela policy. A group of “Friends of Venezuela” containing diverse countries could be organized to develop common criteria and approaches. Such a group could emerge in the region without U.S. involvement, like the Contadora Group in Central America in the 1980s. If it does, the U.S. would be wise to support it. Finally, continued efforts at dialogue should be supported. While the October-November dialogue was unfruitful, and the Venezuelan opposition is right to refuse to return to the table under current conditions, it is an option that should remain alive. In an economic or political crisis, having international facilitators with established relationships close by could be vital. Compared to unilateral actions, the path of diplomacy I am recommending is slow and frustrating. It requires a lot of energy, and does not offer flashy optics. But in the long run it is more likely to succeed and less likely to lead to the unintended consequences of unilateral policies.